Yahoo acquires Tumblr. Talking about big moves. Yahoo paying $1.1 billion. Seems like Tumblr will operate as an independent business with CEO David Karp. Amazing move!?. what will come next? Tumblr now without Mark Coatney (former Media director) and Jacob Bijani (former Creative director), 2 of the earliest employees of the important blog. tool as tumblr, adding another product in their portfolio and rejuvenating the brand. BBM will soon be available for IOS and Android. "Before the end of the summer" - According to CEO Thorsten Heins. This was 1st announced during the Blackberry Live Conference in Florida. BBM, in my opinion, is a great app and I see it as a very smart and strategic move from Blackberry to move in this direction, showing innovation, flexibility, adapting to the times that we are leaving on around technology, but most of all listening to their customers (the users) and even to the users that are using the devices from the competition. Microsoft -> XBOX One. You can get it November of 2013. They describe it as "the ultimate all in one entertainment system", is it true? I like video games and I tried them all, in all platforms and devices. I can say that I found features in one that are not in others and "viceversa". This Xbox feels like a computer to me, even in my references you can find an article that calls it "mini-PC". They went ahead with x64 8-core AMD Jaguar CPU. they also added Blu-ray drive...big move. It also comes with HDMI out and in for integrating with the TV watching experience. This console is coming with Kinect functionality built into it... "the console is always listening". you can read the rest of the features from the reference link. Google Loon. Talking about innovation and entrepreneurship. What will be the next Google step or project... I'm always looking forward to that. "Internet for everyone". This is a network of balloons on the edge of space, designed to connect people in rural and remote areas. My only question would be around "impacting the environment". comments please share them, I want to hear about it. I found this idea incredible and with potential. Microsoft and Windows 8.1. former name "Windows Blue", launched during the developer conference in San Francisco. The start button IS BACK BABY. For those that could not be without it. This modern UI is slick, don't you think? and it is just getting better. They are making it so easy to use the windows that it is not just the OS of your work office PC but it is your tablet, your phone. I'm impressed! Look at the list of new features and fall in love all over again with Windows. This is no longer the IOs and Android neighborhood. There is an old guy in town, he is back and getting younger again. Keep it coming, with more and better competition better the products. Apple - iOS7. who is not in love with Apple products? They are pretty cool on what they do and iOS7 is coming better than ever. Personally the Control Center and the multitasking are 2 of my favorite features. There are coming with a more "flat" look making it clean and refreshing design. Some are talking about how similar iOS7 is looking, in terms of features, to their competitors Android and Microsoft. In this industry you don't know who is copying who anymore, the fact is iOS7 is looking beautiful and great, Apple keeps bringing amazing products and not letting their consumers down. You can tell how good they are doing by checking the market share. Looking forward to see the release! 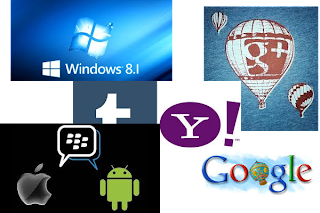 Controversy around the main Technology firms. I close this summary by mentioning the controversy that has been around the NSA, the PRISM and the companies Microsoft, Google, Facebook, Twitter, Yahoo, Apple and other big ones. Below 3 links that can provide you with some information around this subject.